Outdoors is a great space to enhance and extend children’s learning. There are lots of children who have a natural affinity with the outdoors and use it as their preferred learning space. As adults supporting children’s learning, it is important to support the investigation of their outdoor environment, but also that learning is taken into those spaces and delivered to children in the most engaging way that it can be. What you can (almost) always guarantee is children’s enthusiasm to take their learning outdoors, what you can’t always guarantee is the weather! 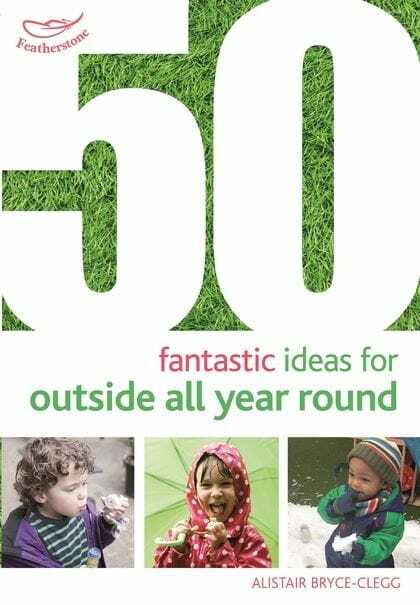 In 50 Fantastic Ideas for Outdoor All Year Round Alistair has created 50 ideas that will get children and practitioners outside and learning come rain, snow, wind or sunshine! All of the activities have got their own central skill that can then be adapted to fit the interests of the children or each setting’s own particular outdoor environment. So, whether your setting’s outdoor space is a back garden, a small yard or large playground there will be activities that can be used and that will inspire young learners.